Shares in Northern Rock have slumped again on speculation that the stricken lender will be sold off at a discount. As criticism grows over the handling of Northern Rock's rescue, the lender's share price dropped as much as 19.53%. This reversed earlier gains prompted by the government's promise on Monday to guarantee all the savings in Northern Rock accounts. Its shares are now down more than 50% since last Friday, but other banks and finance firms continued to recover. A £10bn lifeline issued to banks from the Bank of England to help the frozen money markets return to normal also drove financial shares higher. Bradford & Bingley was one firm to gain from the cash injection which could bring down the rate of interest on short term loans between banks. It ended the trading session in London ahead almost 11%, while Alliance & Leicester closed up almost 3%. BBC Business Editor Robert Peston says that under the Bank of England injection, individual banks can only apply for £1.5bn each under the £10bn facility. The Bank also says that Northern Rock would have needed far greater funds - and that if this facility had been provided three weeks ago, the liquidity would not have eliminated the Rock's funding difficulties. Shares in Northern Rock fluctuated wildly, but were down 16.01% at the end of the day at 257p with Edinburgh-based fund manager Baillie Gifford selling off a portion - some believe all - of its stake in the once highly regarded Newcastle-based firm. In February, Northern Rock's share price reached a year peak of £12.51, reflecting the strength of its loan book and confidence in its future prospects. Now Northern Rock's future as an independent company is considered untenable. Names are being thrown around as to who would be most likely to buy the stricken mortgage lender, most likely at a lesser price than what its flagging shares are currently worth. Lloyds TSB and HSBC have both been tipped as contenders to use Northern Rock as a way of expanding their mortgage business. Meanwhile, Deutsche Bank confirmed it had acquired 3.64% of Northern Rock at one point, but this had been sold down below 3% by the end of the day. The German bank said earlier that the purchase was not a strategic investment but a short term trading position, which means it could change at short notice. Meanwhile, Northern Rock said that its business had returned to normal with no queues outside its 76 branches and call volumes back down to more levels typical of an average day. It also said that trading hours had also returned to normal, with branches open at 9pm until 5pm, in contrast with the extended opening hours on Monday and Tuesday. Separately, the Bank of England and the Financial Services Authority were at loggerheads over the last-minute rescue of Northern Rock, according to newspaper reports. According to the Financial Times, FSA officials had reportedly urged the Bank to offer an emergency loan to Northern Rock weeks before the crisis. But the Bank refused, citing the "moral hazard" of a bail-out. Others have blamed the FSA's light regulation for fuelling a system under which banks like Northern Rock could grow rich using cheap debt. The Bank of England had initially refused to prop up Northern Rock's business after the Newcastle lender found it could no longer access affordable short-term loans in the money markets because of the global credit crisis. The Bank's view was that a bail out would send wrong signals to the banking sector, encouraging the continuation of risky practices. 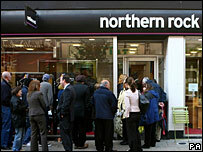 But Northern Rock executives believe that earlier action could have averted the crisis over the past few days that saw thousands of savers queuing up at branches up and down the country to withdraw their money. The bank's share price slumped by more than half in two days. Recriminations have also been levelled at the Bank of England for not doing enough to help engineer a swift sale of Northern Rock when it was clear it was headed for troubled times. 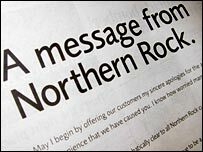 Initially, the Bank refused to extend its emergency credit facility to a potential Northern Rock suitor. But even after relaxing this stance, many believe the rate of interest at which this facility is being offered - some say about 7% - is too punitive to be attractive to a buyer. BBC Business Editor Robert Peston said: "Top British bankers - who met the FSA again yesterday - are sickened that their industry, the very heart of the economy, should have been tarnished by those pictures of anxious depositors scrambling to withdraw funds." Bank of England Governor Mervyn King is expected to face gruelling questions over the Northern Rock crisis when he appears before members of the House of Commons treasury select committee on Thursday.